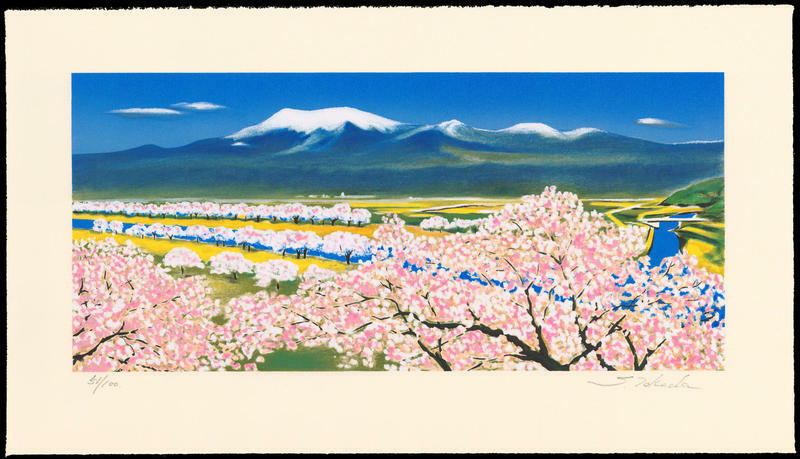 Takeda Shigeru (born 1949) "River Surface of Cherry Blossoms (Yamagata Prefecture)" - Lithograph - Chinese and Japanese woodblock prints for sale, silkscreen, scrolls, watercolor, lithographs. Artwork Details for Takeda Shigeru (born 1949) "River Surface of Cherry Blossoms (Yamagata Prefecture)"
Notes: A beautiful landscape scene of the Zaou Mountain Range in Yamagata Prefecture (山形県・蔵王連峰). Edition 51 from a total of 100 prints. One of a total of five scenes from the series "Scenes of Four Villages". All five scenes can be seen here (notice the $800 price tag for each print).